Enter primary e-mail address for initial contact. A confirmation message will be sent to this address. Minimum Entry Age for For School Year 2018/2019 : Early Entry Program (EEP): 3 years old on or before 1 March 2018 / Kindergarten: 4 years old on or before 1 March 2018 ------------------------------------------ Minimum Entry Age for For Next School Year 2019/2020 : Early Entry Program (EEP): Born in 2015 / Kindergarten: Born between 2 March 2014 - 1 March 2015 ------------------------------------------ Younger children may be eligible for programming under Alberta Education's Program Unit Funding (PUF) for children with severe disabilities/delays who require support beyond that offered in regular ECS programs. For information on the PUF eligibility, contact your local Catholic School. Please indicate which school you want to register your child. Refer to the attendance area section of the web site to determine the designated Catholic Schools for your area. If you do not know your designated school, please select this option and we will contact you. Transportation services are only provided to the designated school for your area. You can register your child to a school outside your attendance area. However, you will have make your own arrangement for transportation. Indicate preference for morning or afternoon. Indicate your preference for the Kindergarten Program. Note that space is limited in some of the programs. A fee of $200/month applies for the Enhanced Kindergarten Program. The Enhanced Kindergarten Program is NOT available at St. Kateri and Sister Mary Phillips Schools. Enter Legal Name of student as it appears on official government issued document such as birth certificate or residency document. ASN will only be available if the student attended an Alberta School previously. New students will be provided an ASN once the registration is processed with Alberta Education. If Fort McMurray Address is not available, please provide current address. Do not enter a postal box, a street address is required. Mobile Phone number will be used first by school to contact the mother or in case of emergency. A separate authorization form will be required to allow staff to administer medication and/or provide specialized response to medical alert. Please contact the school to discuss this if this applies. 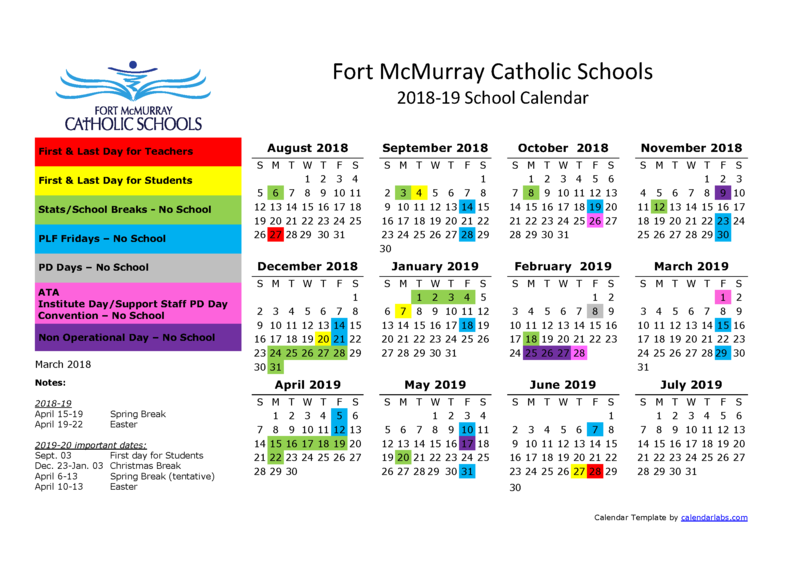 Fort McMurray Catholic Schools welcome members of all faith communities interested in having their children educated in an environment permeated with the teachings of the Catholic Christian Faith. Parents of students that are not of the Catholic faith will be required to meet the Principal of their school to complete the registration process to discuss these expectations. If this applies to you, please contact your school to arrange an appointment with the Principal. If English is not mother tongue, will the child need English as Second Language assistance? Has your child received any of the following assessments? Does your child has a current Individual Program Plan (IPP) or an Instructional Support Plan (ISP? Some of these notices and questions are mandated by various legislations and must be provided to parents as part of the registration process. Section 11.1 of the Alberta Human Rights Act requires a school jurisdiction to provide notice to a parent or guardian of a student where courses of study, educational programs, instructional materials, classroom instruction or exercises, prescribed under the act include subject matter that deals primarily and explicitly with religion. You are hereby advised that you are enrolling your child in a school district where religious instruction, exercise and instructional materials are used and that religion permeates the school program. Fort McMurray Catholic Schools offer an education that is permeated by our Catholic faith values. Catholic religion is not only a core subject that is taught within our schools, but is the foundation of the daily educational experience provided to our students. The Aboriginal self-identification question helps determine the number of First Nations, Métis and Inuit students in provincial school authorities. This information is collected during the student registration and annual verification process in public, separate, Francophone, charter and Level 2 accredited funded private school authorities. It is a voluntary choice for parents/guardians to identify the student as Aboriginal. For further information, please refer to: www.education.alberta.ca/system-supports/resultsreporting or contact Alberta Education at 780-427-8501. If you have questions regarding the collection of student information by the school board, please contact the School Board Superintendent at 780-799-5700 or by email at info@fmcsd.ab.ca. Pursuant to Section 23 of the Canadian Charter of Rights & Freedoms, Canadian Citizens whose first language learned and still understood is French, or who have received their primary school instruction in Canada in French or whom any child has or is receiving primary or secondary school education in French in Canada have the right to have their child receive primary and secondary education in the same language. In Alberta, parents can only exercise this right by enrolling their child in a Francophone program offered by a Francophone Regional Authority. Parents eligible for Francophone Education may be contacted by the North Central Francophone Region School District asking if they want to exercise their right to a Francophone education at Ecole Centre Boreal School located in the Abasand Sub-Division. I will notify the school of any changes in the information provided on this registration form. I give permission to release the Student Record Portfolio (Personal & Confidential Records) from my child's previous school to the school he/she will now attend. I will notify the school of any changes in my child's medical condition that could impact his learning or his safety at school. I agree to pay all the required fees for transportation services, field trips, damages to textbook or property as set by the policies and regulations of the School or the Board. I will provide the school a copy of the documents necessary to complete the registration of my child such as Birth Certificate or Proof of Citizenship. I hereby declare and certify that the information provided for this registration is true and correct to the best of my knowledge. I agree to receive email messages from the School or the School District providing general information related to Catholic Schools or Youth events or activities. I agree to follow the policies and regulations set by the School and the Catholic Board of Education. If you have any questions on any of these statements or declarations, please contact your school administration.